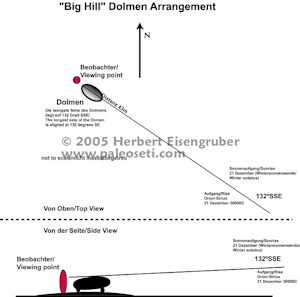 The Dolmens und megalithic walls of "Big Hill"
This site is simply spectacular. 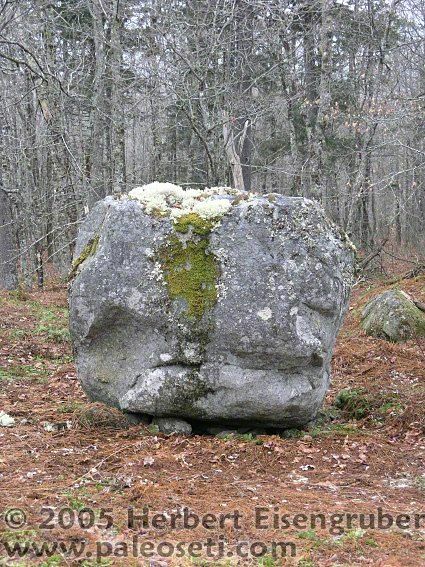 Here the last "this-is-all-natural-stone-formations" sayers have to throw in the towel. Right next to two (!) Dolmen there are huge megalithic walls that rival some South American counter parts. These walls are completely untouched, have never been excavated or even been published anywhere. 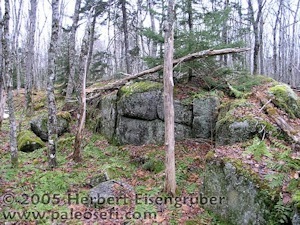 I visited the site in 2004 shortly before the winter which is the best time. The leaves are off the trees and the structures are visible better compared to the summer, when thick brush and leaves obscure and hide them. If you come up here the first time you will be overwhelmed by the complexity and size of the structures. You would only expect somethng like this in the jungle of Guatemala. This site would need years of systematic investigation, excavation and measuring. It would need funding for a official excavation, but nobody official seems to be interested. I doubt that anybody in the official archaeology field will ever be interested in the site as it would completely re-write North American pre-history. After all it took decades to acknowledge the Viking settlement L'Anse aux Meadows in Newfoundland. 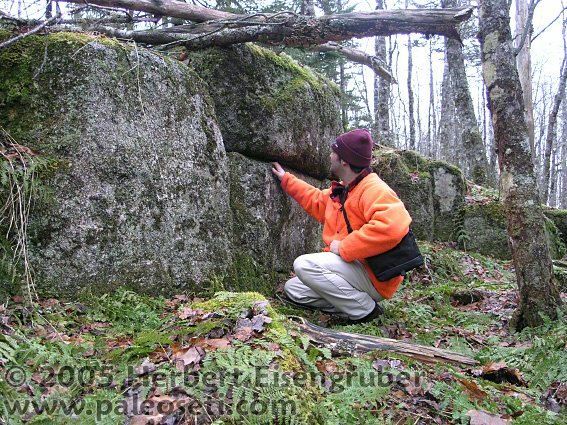 So it's up to us amateurs to investigate and publish about this megalithic site. The site is completely inaccessible from November until May. During my first investigation of the site in late November a blizzard started right after I took some of the images you will se below and I had difficulty getting home from the site. The site is located on the highest mountain in the area. Without the trees it would overlook the whole area. Within the structure is a Dolmen that rests on three base stones. 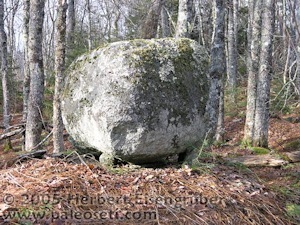 The Dolmen rests on a plattform that seems to be especially made for it. If you click on the image on the left you can see the plattform more clearly. Here a closer look at the base stones. 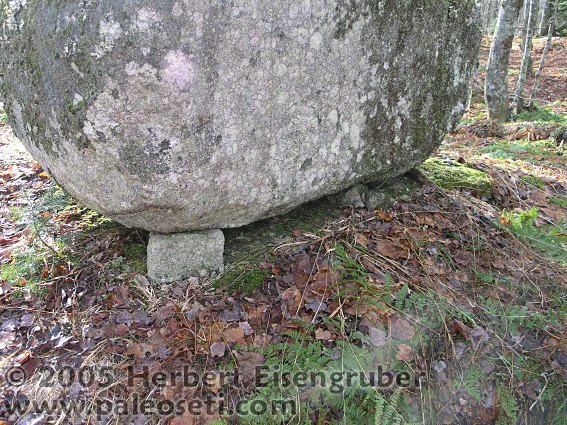 The longest side of the Dolmen is aligned to 132 degrees SSW. 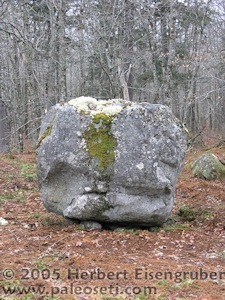 Regarding this finding, please check my findings at the Kidston Dolmen. 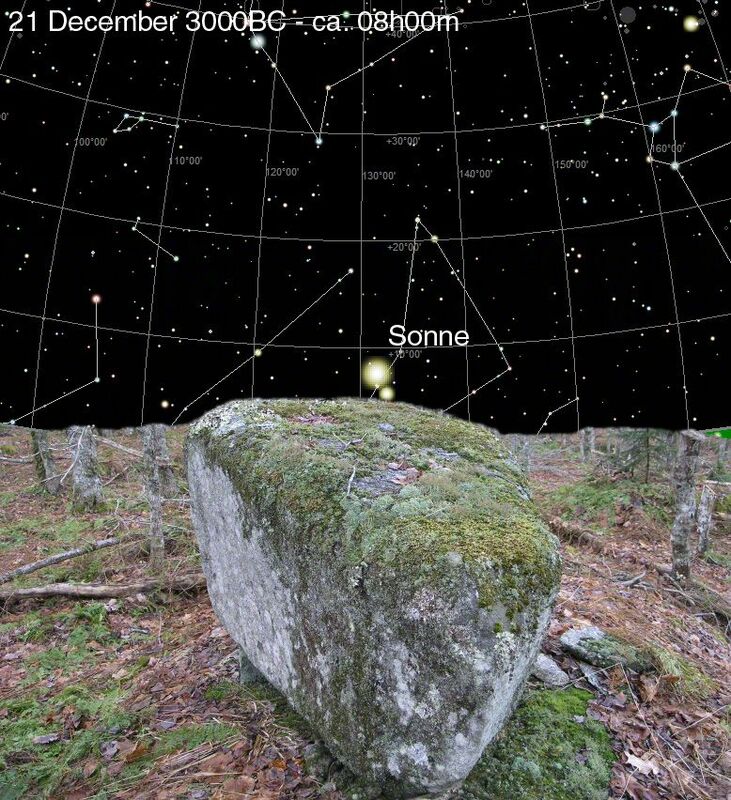 To better illustrate the astronomical alignement of the Dolmen, I created a little computer simulation. 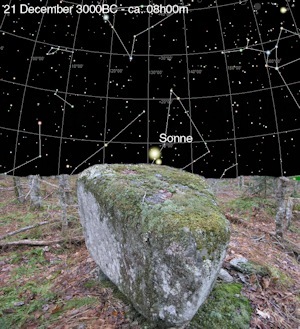 It shows that around 3000BC the sun was rising right above the dolmen in the winter solstice on the 21st of December. 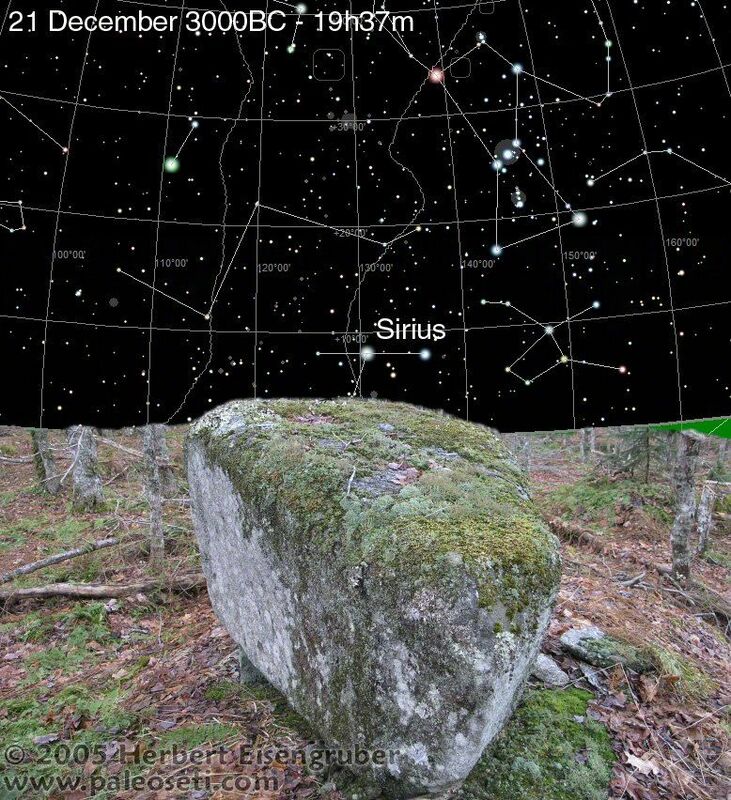 For the simulation I mixed an original photo of the dolmen with simulated image of the sky using the excellent and very accurate software "Sky Charts". It is extremely difficult to determine the age of a megalithic site without excavations. 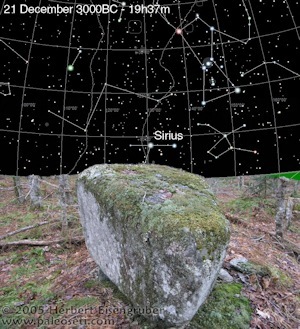 This is why I take the approach of establishing astronomical alignments for the sites. If you compare the Dolmen of North Korea, you can see the similarities to the sites in Nova Scotia. 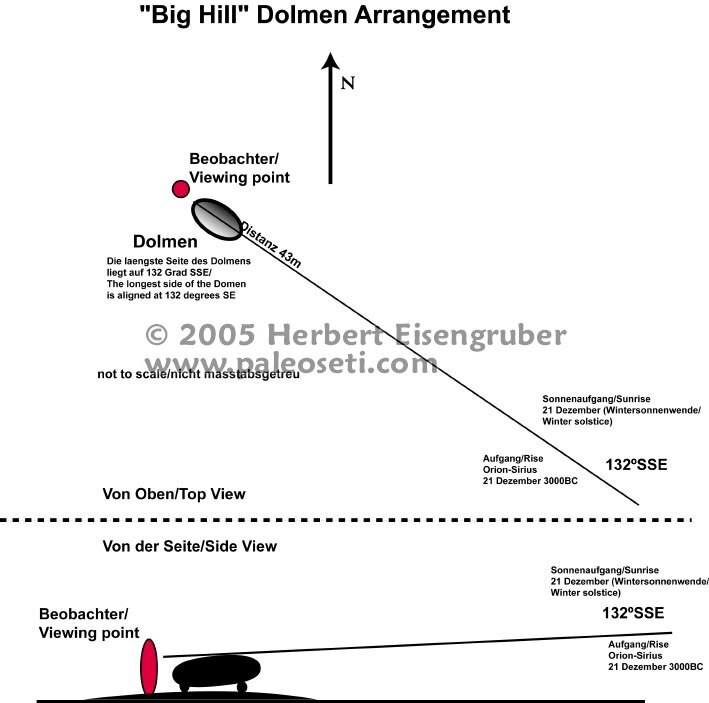 The third illustration on the left shows you how the Dolmen is arranged. Click on the images to get higher resultion images. 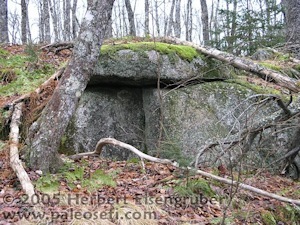 A second dolmen is located about 50m from the one I described above. 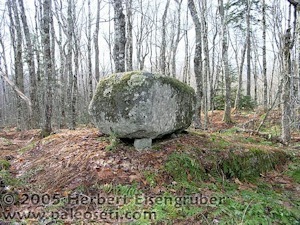 This Dolmen also rests on smaller base stones. 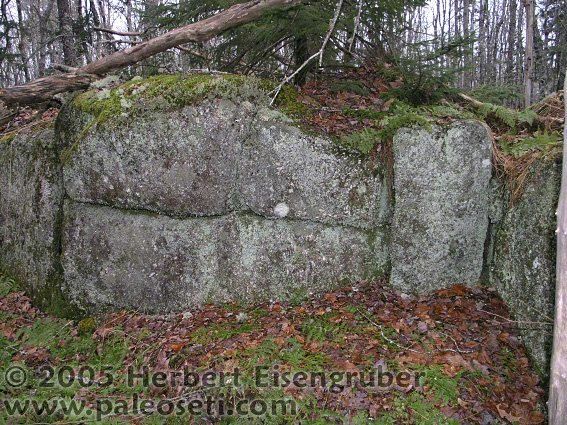 Is this the ultimate proof of a North American Megalithic culture? Huge boulders were precisely cut and fit together in a huge wall. The stones remind me of some Inca walls I was able to study in Peru, South America. Those are "serious" ruins and compare to nothing the modern time settlers have built in North America. What surprises does this site still hold? The megalithic remands of the walls are approximately 1.50m high. Here you can see how precisely the stones of the walls are fit into each other. Look at this structure. It looks like the remnands of a tomb. 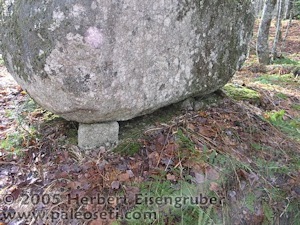 There is a large roof stone held up by two base stones on the bottom. Half a year later we were back at the site to do more research. We found amazing new things like this square hole in the ground. It looks like it might be an entrance to an underground structure. The walls run a few hundred meters in every direction and form roughly a square that encloses a big part of the hilltop. On some spots the stones of the walls are gigantic. Some of the boulders and stones are so clearly marked by human hand that it is almost daft to say those are all natural formations.